The British government has apologised for killing a south Armagh girl, who was shot dead by a paratrooper almost 35 years ago. 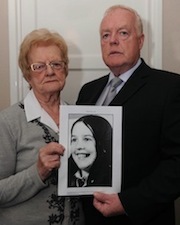 Majella O’Hare was shot twice in the back after she walked past a checkpoint in Whitecross in August 1976. An apology from the Ministry of Defence was handed over to Majella’s elderly mother on Monday during a private meeting at Hillsborough Castle yesterday. The letter offered no explanation for the murder. It said only that the original excuse -- that the shots were fired in response to an IRA sniper attack -- was “unlikely”. It is the second time an apology has been offered for incidents involving the British army during the conflict (the first being for Bloody Sunday) and came after years of campaigning for truth and justice by the O’Hare family. Speaking after the meeting with Mr Paterson, Majella’s mother described how she still feels “lonely and sad”. “It was something at the end of all these years but nothing brings her back,” she said. Majella, the youngest of five children, was shot in the back by a soldier on patrol near her home in Ballymoyer, as she walked to Confession. Her father had been working at a nearby school and was the first on the scene. She died in his arms on the way to hospital. Private Michael Williams, of the 3rd Battalion Parachute Regiment, was later charged with manslaughter, but was acquitted in court. British officials have said there are no plans to now bring charges in the killing. Majella’s brother, Michael O’Hare, said that even though his father Jim had not lived to see his family vindicated, their long campaign had been fought in his memory. Mr O’Hare said: “We have to accept that closure never happens in a case like this. “If you lose a child or sibling closure is a term that never really comes. “It is not closure but we have moved along the way. It has been a long time coming.